Integrity Integration has partnered with the UK’s Printed Electronics Ltd in offering PEL’s UV LED Curing System for the Dimatix DMP-2831. This UV LED Lamp curing system can be integrated with existing DMP-2831 and print process software for UV ink-based process development and optimization. The active curing head is designed to attach directly to the print carriage and trails the print. “In-line”: Print and immediately cure or pin (it has variable UV intensity settings). “Second Pass”: Print the whole image, followed by a second scan over the image to cure or pin. “We are very excited to have this capability in our lab and to offer this useful process development technology to our customers”, says Dr. Rich Baker, President and founder of Integrity Integration. “Expanding the use of the DMP-2831 to assist our clients in developing their UV ink jet applications provides a very cost effective way to validate and optimize UV processes prior to prototype development”. Integrity Integration is an official re-seller of this technology in the US. It is available in the EU directly from PEL. 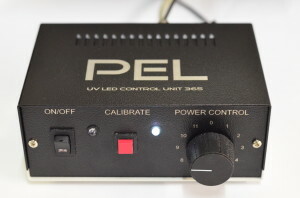 The price is $2,950 (USD) for the UV LED Lamp Curing System controller and the LED. Contact Integrity for more information. System requirements: The DMP PC must be running Windows 7 (32 bit) and must have the latest DMP software (available from Dimatix). Contact Integrity for more information about a complete solution to your UV Ink Jet development needs. 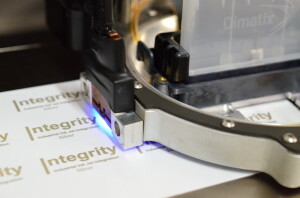 To find out more about UV Curing for the Dimatix DMP-2831, contact Integrity or visit the Integrity Integration website. Integrity Industrial Ink Jet Integration offers expert and experienced full-service industrial ink jet integration helping clients take their industrial ink jet application from conception to implementation. PEL’s UV LED Lamp Curing for DMP-2831 & DMP 2850, now available in the US through Integrity Industrial Ink Jet Integration.